Free Almond Delight Collection with Orders Over £55 at L'Occitane Who doesn't love a freebie? Use this code to get an amazing one free with orders over £55 at L'Occitane! Free Love Collection with Orders Over £45 at L'Occitane Enjoy a free gift from L'Occitane worth £21 when you use this code on an order of £45 or more. Free Trio of Samples with Online Orders at L'Occitane Every order that you place online, you'll get to choose a trio of samples that you'll receive for free! Free Delivery on Orders Over £35 at L'Occitane No need to worry about delivery fees with L'Occitane. Get your goodies delivered for free when you spend over £35! Free Gift Wrapping with Orders at L'Occitane Whether it's for someone special or you just fancy treating yourself, gift wrapping is free! Fragrances from £49 at L'Occitane Explore the fragrance collection at L'Occitane, starting from £49! Free 5 Piece Almond Collection on Orders Over £45 at L'Occitane Don't miss out on a great deal when shopping at L'Occitane! Free Almond Shower Oil on Orders Over £20 at L'Occitane Get a free almond shower oil when you spend over £20 at L'Occitane! Free Beauty Essentials Collection on Orders Over £120 at L'Occitane Don't miss out on this great deal from L'Occitane! Free Cleanser on Orders Over £55 at L'Occitane When you're ordering at L'Occitane and spending over £55, get a free cleanser! Waterproof Bluetooth Speaker for £10 on Orders Over £40 at L'Occitane Get a waterproof speaker so you can sing your heart out in the shower, for just £10 when you spend £40 or more at L'Occitane. Free 6 Piece Collection on Orders Over £45 at L'Occitane Spend over £45 at L'Occintae and get a delightful free gift! Free Hand Cream or Shave Balm with Selected Full-Size Fragrance Orders at L'Occitane Buy a new fragrance and get a little extra something for free at L'Occitane. L’Occitane’s journey started back in 1976, when its founder, Olivier Baussan distilled rosemary oil and sold it at markets in Provence. The first L’Occitane store and factory opened in 1981, and since then, the brand has expanded to include 2,700 stores around the globe today. 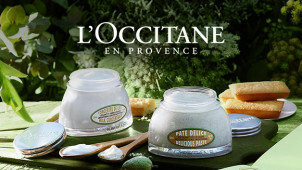 L’Occitane is quintessentially French, with many of the products' key ingredients sourced from the fields of Provence. All its products are naturally derived and some are 100% organic. If you hanker after a top-notch, nourishing beauty routine, you’d be mad not to sample the bodycare, hair care and skincare goodies on offer at L’Occitane. You will find rich and sumptuous moisturisers, day and night creams, cleansing products and hair oils that will leave you feeling like you’ve spent all week at a luxury spa. Men are well cater for too, so if you’re into a bit of male grooming - go check out the shaving products, aftershave balms, shower gels and ultra rich body creams. You’ll be smelling and looking so good, you’ll never want to go back to your old routine. How do I use my L’Occitane discount code? Sign up for the e-newsletters to be the first to know about the latest product launches, beauty tips and exclusive offers. Does L’Occitane provide gift wrapping? Yes, every order is perfectly dressed to delight you or your gift recipient, for free. Wrapped in a Provençal-style box or sachet, you can add a gift message to your order to create the perfect gift. Does L’Occitane offer Click & Collect? Yes, you can find more information on the Click & Collect page of the website. Does L’Occitane offer a replenishment service? Yes, an auto-replenishment service gives you another great way to shop your favourite products on repeat, by simply choosing how often you want to receive your products. Call: 0800 368 9000 - Monday to Friday: 9.00am-5.30pm (excluding Bank Holidays). Or choose an option on the Contact Us page of the website. L’Occitane will issue an exchange or a full refund to the original credit card for any unopened merchandise that is returned within 28 days of the date of purchase. All items must be unopened and in a saleable condition. L’Occitane cannot offer exchanges or refunds on any opened or used products. Use the Boutique Store Finder tool to source this information. L’Occitane is our favourite French cosmetics producer, guaranteed to make you go ‘oh la-la’ every time you spritz or moisturise. If you like fresh, natural beauty products, why not use your L’Occitane discount code to purchase some skincare tonics or a gift for someone who appreciates quality when it comes to skin and hair nourishment. Click through pages of gorgeous floral perfumes, bath oils, shea butter hand creams and ravishing gift sets on the L’Occitane website. If you’re a regular traveller who likes to take your favourite essentials wherever you fly to - head to the L’Occitane Travel Sets pages, so you can take a little piece of Provence with you. Packaged into handy mini bottles, you’ll find everything from Radiance and Colour Care Conditioner to Cerisier Pastel Hand Cream and Citrus Verbena Shower Gel to keep you refreshed and smelling divine after a long flight. Some of L’Occitane’s travel products come in a handy case so you don’t loose individual bottles. There’s nothing more appealing than fragrances that remind us of a long hot summer spent in the south of France. If you’re pining for a fresh and zesty Eau de Toilette, scented pillow sachets, candles or room spray, use your L’Occitane offers to purchase from the amazing array of perfumes and fragrances on the website. We love L’Occitane’s Verbena room diffusers, Jasmine candles, roll on perfumes and Lavender scented sachets for bringing back memories of our favourite holidays.